The other night we had ham steak for dinner. The steak was large for the 2 of us meaning there was enough leftover to be used in another meal. There was also a bone in the steak. 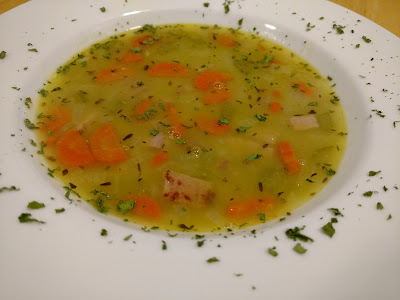 Chris suggested Split Pea Soup. I was thinking a quiche, anything for the crust. I decided to go with the soup. I found a recipe for Classic Split Pea Soup on the Food and Wine site. Simple to make. 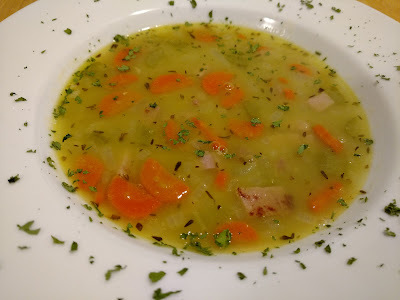 I added the ham bone during the initial simmer and then added the cut up ham towards the end of the recipe. Split Pea Soup usually has the consistency of wall paper paste. Or could be referred to as a stick to your bones soup. This recipe was not at all like that. It was a light consistency. It was perfect with toasted Rosemary and Olive Oil Bread! love the new site its looks awesome!